The government yesterday (Fri) placed an export bar on an “extraordinary” sculpture of Queen Victoria to prevent it leaving the country. Arts Minister John Glen is hoping a buyer can come forward with £1.45 million to save the 1887 bust made by master sculptor Alfred Gilbert. The export ban on the “remarkable” depiction of the ageing monarch will remain in place until December. But if a serious buyer comes forward the Department for Digital, Culture, Media & Sport may extend the bar until April, 2018. The sculpture is valued at £1.2 million + VAT – and the buyer will have to match this price. Mr Glen said: “This captivating likeness of Queen Victoria showcases the extraordinary skills of celebrated sculptor Alfred Gilbert. 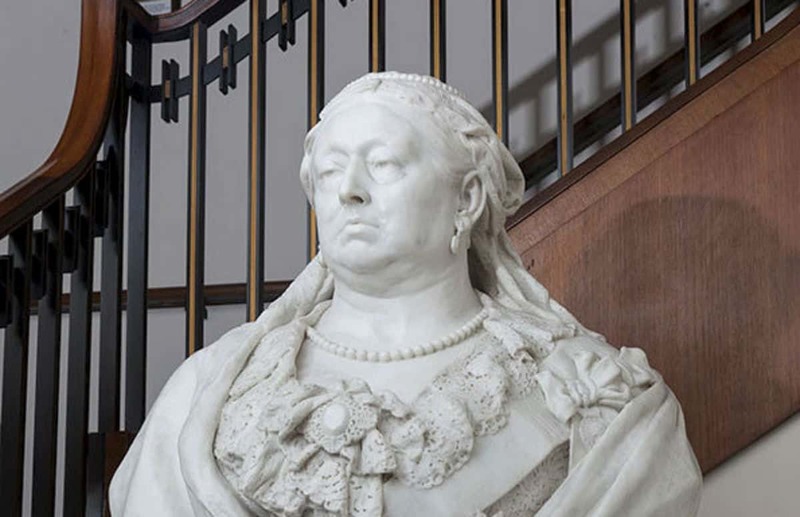 The sculpture depicts Queen Victoria towards the end of her long life. The marble has been sensitively carved to reflect the texture of her skin and her meditative expression, as well as the soft swirls of cloth around her head and shoulders. While the bust has the appearance of a highly realistic likeness, the sculptor did not work from life but from photographs, using his own mother as a model for the figure and drapery. He said at the time, ‘One was Queen of my country – the other Queen of my heart’. Gilbert was one of the foremost sculptors of the day, but also temperamental. The bust originally had a metal crown, but Gilbert regretted the decision and removed it, promising instead to supply a marble one. However, he never delivered the replacement and the bust remains uncrowned. He was commissioned to make the bust in 1887 by the Army and Navy Club to celebrate the golden jubilee of Queen Victoria’s coronation in 1837, as well as its own jubilee. Gilbert’s other celebrated works include the Shaftesbury Memorial – better known as Eros – at Piccadilly Circus in London, and a tomb to Prince Edward, Duke of Clarence, in St George’s Chapel, Windsor. Lowell Libson, RCEWA member, said: “Sir Alfred Gilbert, a leading but mercurial light in the British ‘New Sculpture’ movement, is now regarded as one of the greatest European sculptors of the period. “This monumental portrait bust of the Queen-Empress is not only an important icon made at the apogee of British power but a complex and hugely sympathetic image. The RCEWA added that the it is a fine piece of work by “the leading British sculptor of his generation”. Next PostToddler lived through a life-threatening transplant, brother may face the same ordeal.